On 30 March 2010, English words like 'newsletter' and 'buzz' ceded their place to expressions created in 'Francomat', a French student contest. Will this initiative by Alain Joyandet, secretary of state for Francophonie, catch on in the rest of Europe? It may be a cliché that the French are proud of Molière's language, as the old adage goes, but it continues to prove true. 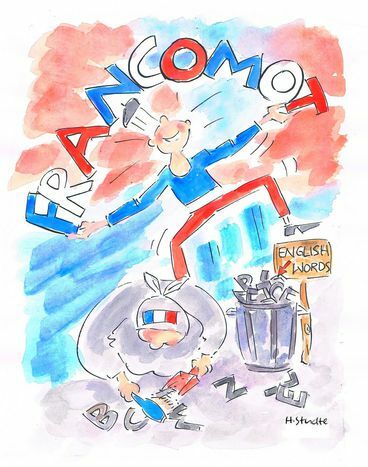 Take January's 'Francomat' competition, organised by Alain Joyandet. Since 30 March, students have been replacing five lexical anglicisms with made-up words, under the leadership of a jury presided over by the writer Jean-Christophe Rufin and made up of rappers like MC Solaar or Sapho. The Youtube videos will no longer cause a buzz on the French net, but a ramdam, in a word taken from Arabic. Gone are the days of the chat: instead, students will l’éblabla or tchatche. Those who enjoy tuning (souping up cars) will from now on do bolidage. French anoraks (franoraks?) who get newsletters from online papers will need to get used to infolettres (a contraction of the words information and letter) or boletíns in Spanish. Those who listen to talks via podcast will now listen to débats. Germans don’t pose such questions over anglicisms: France’s neighbours will chatten until the cows come home. They have even created anglicisms, such as Handy (the mobile phone) that even English speakers don’t use! Italian falls somewhere between the other two languages. On one hand, Italian bloggers chattano (chat) during Annozero, Michele Santoro’s talk show, but each time prime minister Silvio Berlusconi steps out of his home, it’s described as a passaparola, not a buzz. The fact remains that Italian language pride goes even further. Beppe Severgnini, journalist for Corriere della Sera, likes to mock Italians who anglicise prolifically, especially in IT or industry. In his book Riscopriami l’italiano: lezioni semi serie ('Rediscover Italian: Half-Serious Lessons'), he wonder with false naivety: 'Why use the word brand when you can say marchio? Meeting and not riunione?' Anglophones must laugh at our pseudo-anglicisms. The 'buzz' or hype and a good video on Youtube will make viral history. Across the channel, this will surely not cause a 'ramdam'! Translated from «Buzz», «chat», «tuning» : la fin des anglicismes en Europe ?